Pro-choice feminist groups continually insist you can't be feminist and "anti-choice." Netflix' recent "Reversing Roe" documentary cut tons of footage of pro-life women and showcased almost exclusively men for the anti-abortion side. The incessant "war on women" trope leaves casual observers believing this is a strongly gendered debate, with women fiercely defending abortion and men trying to control women’s bodies. It's all a lie. Roughly half of American women are against abortion whether you look at the issue by labels (“pro-life" vs "pro-choice") or by views on abortion legality. Tens of millions of American women are against abortion. We are a HUGE demographic, and this fact has been true for decades. Make no mistake: we aren’t being overlooked because we’ve been sitting quietly in the background. Women lead many of the major pro-life organizations and speak out on the issue regularly. 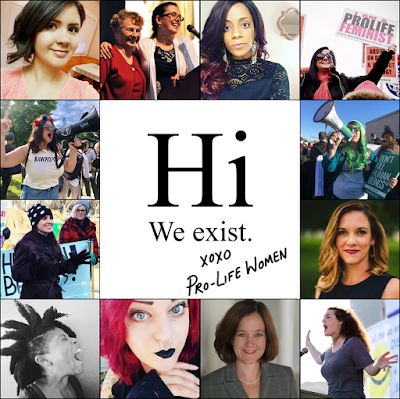 There are countless female pro-life leaders in addition to the women pictured above, such as Carol Tobias of National Right to Life​, Lila Rose of Live Action​, Kristan Hawkins of Students for Life of America​, Marjorie Dannenfelser of Susan B. Anthony List​, Abby Johnson of And Then There Were None​, and Serrin Foster of Feminists for Life​. Nellie Gray founded the March for Life​, which has consistently been the largest pro-life event and largest annual political march for years. We sure would appreciate it if the pro-choice side and the media would stop trying so hard to pretend we don’t exist for the sake of a narrative. We are RIGHT. HERE. The "Anti-Choice War On Women"
7 things pro-lifers wish our pro-choice friends understood about us. "The people want Roe to stay." SCOTUS Watch: Which Senators Might Flip?